The Creative Time Summit is a two-day conference that brings more than forty cultural producers together to discuss how their work engages pressing issues affecting our world. Their international projects bring to the table a vast array of practices and methodologies that engage with the canvas of everyday life. The participants range from art world luminaries to those purposefully obscure, providing a glimpse into an evolving community concerned with the political implications of socially engaged art. 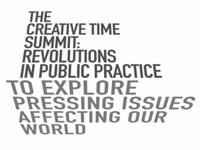 The Creative Time Summit is meant to be an opportunity to not only uncover the tensions that such a global form of working presents, but also to provide opportunities for new coalitions and sympathetic affinities. 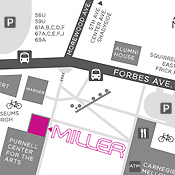 Over 500 people attended the Immaculate Reception for the Whatever It Takes exhibition on Sept. 10th - one of the highest attended events at the Miller Gallery. 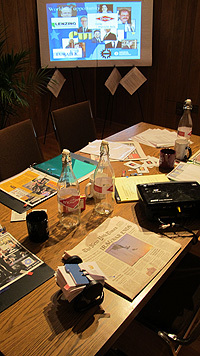 The exhibition was featured in the New York Times, on ABC-affiliate WTAE Action News, and on the covers of Pittsburgh City Paper, Pittsburgh Tribune-Review (headline story! ), and Pittsburgh Post-Gazette's Magazine. 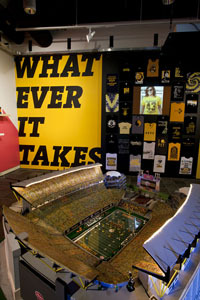 WHATEVER IT TAKES: Steelers Fan Collections, Rituals, and Obsessions looks at the particular and ingenious methods Steelers fans use to construct their own personal and social identities in relation to the team, and in the process, create an active community of cultural producers. Through countless fan sites, gameday rituals, costumes, tattoos, videos, unlicensed merchandise, and more, Steelers fans brilliantly remix and meld the team's identity with their own. Over 450 people attended the Keep It Slick exhibition reception and presentation by Yes Man Andy Bichlbaum on Sept. 23, making it one of the highest attended lectures at Columbia College's Glass Curtain Gallery. Reaching countless people through websites, newspapers, and television broadcasts, the sometimes anonymous Yes Men are among the most visible and effective artist-activists of our time. Over the past dozen years they have fearlessly taken on the world's biggest corporations and bureaucracies through a process they call "Identity Correction," helping to keep critical issues in the international spotlight. KEEP IT SLICK represents the first-ever solo exhibition of The Yes Men.